No longer settle for pre-packaged pasta with the KitchenAid 3 Piece Pasta Roller Attachment. Includes Pasta Roller, Spaghetti Cutter and Fettuccine Cutter. 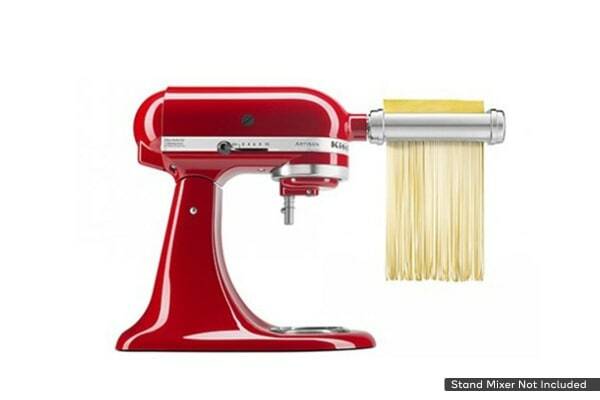 The KitchenAid 3 Piece Pasta Roller Attachment allows you to take pasta dishes to the next level. Powered by the KitchenAid Stand Mixer, the 3-Piece Pasta Roller and Cutter Set makes authentic, fresh pasta from scratch quickly and easily. The attachment includes the Pasta Roller, Spaghetti Cutter and Fettuccine Cutter.